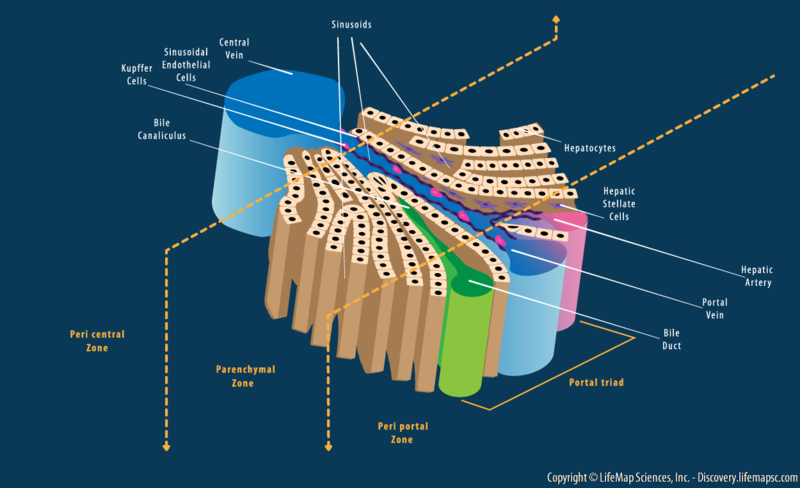 Schematic presentation of the liver lobule structure. The liver is divided into hexagonal-shaped lobules, which have a portal triad of vessels at each corner, consisting of a portal vein, hepatic artery and bile duct. Each lobule is comprised of plates of hepatocytes (parenchymal liver cells), lined by sinusoids. Sinusoids are composed of liver-specific capillaries with fenestrated endothelial cells, hepatic stellate cells (that are located in the disse space) and Kupffer cells. Hepatocytes are highly polarized epithelial cells that form cords. Tight junctions between hepatocytes create a canaliculus that surrounds each hepatocyte. Bile salts produced in hepatocytes are secreted into canaliculi, which are linked to bile ducts. Cholangiocytes (biliary epithelial cells, BECs) form the bile ducts. The region that connects the bile canaliculus and the biliary tree is called ‘canals of Hering’. The hepatocytes are divided into three different zones along the porto–central axis of the liver: periportal, parenchymal and pericentral regions, creating phenotypically and functionally different types of hepatocytes.